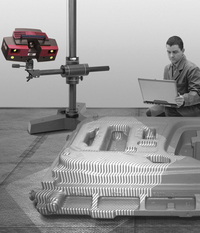 The ATOS Triple Scan uses a specially developed measuring and projection technology from GOM. Using this brand new technology the ATOS Triple Scan produces a high accuracy and improved measurement of shiny surface, complete data on complex components with deep pockets or fine edges such as turbine blades, reducing the number of individual scans and resulting in a simple handling. The ATOS Triple Scan is also equipped with blue light technology. The narrowband blue light enables precise measurements to be carried out independently of environmental lighting conditions. ATOS uses high resolution measuring cameras with up to 12 megapixel resolution and specially developed optics for precise measurement. The accuracy, measurement resolution and measuring area are completely adaptable to the application requirements. This allows for the highest resolution for highly detailed, small parts with measuring volumes down to 38mm, or for extremely fast digitizing of large objects with measuring volumes up to 2m. 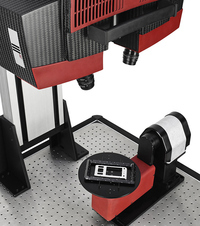 This flexibility allows measurement of a large part spectrum with the same sensor head, and when used in combination with TRITOP, the ATOS System is capable of scanning parts of over 30m with a high local resolution. ATOS 3D Digitizers have been produced and constantly developed since 1995 and with more than 2500 installations in measurement and analysis rooms as well as factory and production halls worldwide, the ATOS has been for a long time an accepted measurement method beside the mechanical measurement machines. The ATOS sensor combines high data quality in short measurement time with flexibility and stability for industrial environments. Automated quality control; improving overall quality assurance, requiring fewer personnel and considerably increasing performance. 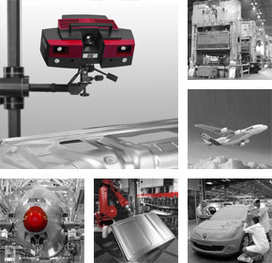 The GOM Touch Probe combines full-field and touch probe 3D measurement. The GOM Touch Probe allows quick measurement in difficult to access areas, comparison directly to CAD, measurement of primitives, quick measurement of individual points and online alignment. The Plus Box add-on for all ATOS Triple Scan sensors enables fully integrated photogrammetry and reference point collection. The ATOS Plus solution is fully integrated into GOM's established digitizing and inspection solutions. The Plus Box allows high accuracy, automated photogrammetry and extends existing ATOS Triple Scan sensor heads. The ATOS Plus features a high resolution photogrammetry camera with up to 29 megapixel resolution and specially developed optics allowing large measurement areas and short working distances. The built-in faceted illumination provides uniform lighting regardless of measurement area or environmental conditions. All ATOS Plus sensors are verified and certified according to VDI acceptance tests. Copyright © 2014 IDS CO. All Rights Reserved.